Made by recycling the byproducts of acrylic paint manufacturing, Tri-Art Sludge Acrylic handles like an acrylic and can be used as a paint, gesso, or painting medium. It's an economical alternative to both a neutral ground and neutral color. 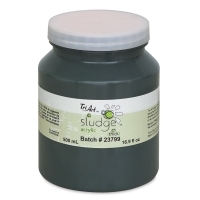 Sludge is semi-opaque and can be used in small quantities as an opacifier or medium-toned color extender. Use it in place of gesso when a muted base is desired. 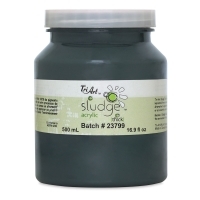 The quantity of solid particulate in the paint gives Sludge a light tooth, so it also makes it a suitable ground for mixed media applications. Because Sludge is made with 100% acrylic emulsion, it's comparable in character to other acrylics. It's highly adhesive to a variety of surfaces, dries to a water-resistant semi-gloss finish, and can be easily applied with a variety of painting tools. No two batches are alike, so each edition is assigned a batch number rather than a color name. Color will vary from batch to batch, but it will typically be a dark green, purple, or gray depending on what color paint was just manufactured. ™ Tri-Art is a trademark.™ Sludge is a trademark.